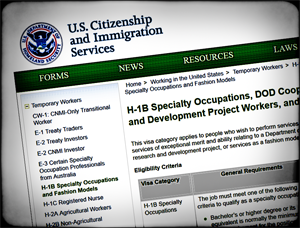 Many exploitative companies take advantage of the federal immigration laws to enhance their profits. Others make use of loose state-level (non-immigration-related) policies to get richer. And a few manage to use both systems at the same time. The media is rarely perceptive enough to notice these "twofer" arrangements, but National Public Radio (of all places) noticed one such deal the other day in North Carolina. In it, Cognizant Technology Solutions managed to: 1) use the H-1B program to reduce wages for its computer programmers, and 2) collect $5 million in local tax breaks while promising to bring jobs to Charlotte, N.C. The company is one of the Indian outsourcing companies that provide IT consulting services to various U.S. companies. Cognizant, a major H-1B user and a Fortune 500 firm, simply did not bother to tell the local authorities that most of its hires will probably be H-1B workers, probably recruited from India — not from the Charlotte area. And the Carolina decision makers were either too unknowing, or too uncaring, to know about the company's long-standing policy of preferring not to hire resident workers (both citizens and those with green cards). It was just another instance in which fast-talking exploiters of the immigration system simultaneously con local pols and the local Chamber of Commerce. Not for a long time, at least not in Charlotte. There's an exception, one chagrined Democratic state legislator, but we will get back to him later. Here's the story, according to NPR's local affiliate, Station WFAE: Cognizant, which already has 1,500 employees in the state, secured a state tax break of $5 million in exchange for promising to bring another 500 jobs to the Charlotte area. The local Chamber of Commerce helped with the negotiations. The station then quoted H-1B critic Ron Hira, now a professor at Howard University, as saying: "the firm's business model is to ship as many jobs overseas as possible. ... if I were a North Carolina taxpayer I would be really baffled and shocked that we would be taking our tax dollars and subsidizing a firm that's actually going to be a net negative for the [local] economy." While the H-1B program is run (albeit casually) by the Democrats in Washington, the N.C. state government is solidly in the hands of the GOP. The state government apparently persuaded State Sen. Malcolm Graham (D-Mecklenburg County) to add his voice in praise of the move. Subsequently Graham told WFAE that he was "disconcerted" after learning about Cognizant's business practices and its reliance on temporary guest workers from overseas. By then it was too late. The Carolina two-step is the third deal we have described in as many months about how state-level GOP politicians have taken advantage of the Obama administration's non-rigorous control of immigration programs. In South Dakota, Republican politicians at the state level allowed tens of millions in middlemen fees to be siphoned out of the state treasury into unknown hands — in that state the regional center for the immigrant investor (EB-5) program was long a part of state government, as we reported in an earlier blog. More recently, in a rather more transparent action, the EB-5 middleman fees in an arrangement concocted by the GOP-run Pennsylvania Turnpike Commission were channeled into the hands of friends of the party leadership running another regional center, as noted in another blog. One is reminded, in part, of the politics of the old Tammany Hall. Except that the bosses of that venerable institution saw to it that the money wound up in the hands of the Democratic ward leaders. Who Got the Jobs in North Carolina?